Normally, I'm not a fan of graffiti because I feel sorry for the people tasked with cleaning it up, but I observed this in our local neighborhood theater and had to share. In case you're not a Classic Gamer, the depiction is of the classic Mario box (for which there is probably a better name than that, but I don't know what). I was tickled and had to pull out the camera phone. Open thread below! 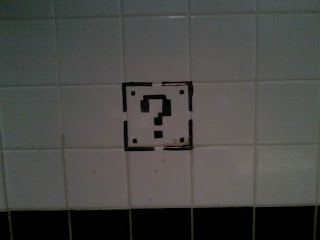 Possible topics: hilarious graffiti, classic gaming, the terminology for Mario boxes, and whether or not theaters are improved by the addition of same. "Question" blocks, "Mystery" Blocks or "Prize" blocks. ... According to the Mario Wiki, and I am so happy that such a thing exists. That is AWESOME. Thank you, Patrick! Boss: The Communications page is completely blank. Me: That's because they haven't sent us any content. Boss: Okay, English Major, go ahead and create a blurb for them. Me: I have a better idea. Why don't I just put in some pictures of graffiti? Then when they finally notice and ask what that's doing on their page, we can say that since it was clearly derelict, taggers must have come by and sprayed it. Me: Admit it, you were tempted for a moment there. - Walking past a newspaper box (remember those?) on campus for USA TODAY, somebody had scrawled across the top, "tomorrow, the WORLD!" - The wall of the unisex bathroom of the local vegetarian / chai / hemp-and-sandals bar, which contained the priceless insult: "Neo-Kantian hosebag!" - And, of course, this. Well, crap. People scrawl entertaining things in the bathroom stalls at the library all the time, but I can't remember any of them at present. I personally think the best solution would be to get some chalkboard paint and chalk and just let them. Sure, we get some of the usual unpleasant stuff, but we get an awful lot of fun stuff, too. I love the long conversations I've seen in some library washrooms. Really deep questions/regular relationship questions answered by thoughtful strangers. Short version: a bunch of kids decide to put up some Mario blocks in their neighbourhood, full of cut-out stars and mushrooms, and the bomb squad gets called. The artist who runs bladediary was quite upset about this (he believes in the importance of graffiti in a general sense). I remember that, in this club I used to go to, one of the bathroom stalls had a limerick written on the door. It wasn't a particularly good one, but then I noticed that all the doors had limericks on them. Then I realised that the first line of each limerick was form another limerick (there were five stalls) and so on. As I say, they weren't great limericks, but credit to whoever did it: they didn't re-use a rhyme. The best graffiti I ever saw, though, was on the door of the English department at my old sixth-form college. Once the staff found out that they would be moving to a new site across town, they started writing poems about llamas on the door. I have absolutely no idea why. I think it began with a llamafied version of the LOTR poem about the rings and just went from there. Graffiti written on one of the stalls at a bathroom at my old university was basically two people arguing over the decimals of Pi. The video game franchise The Sims has running llama jokes. I wonder if that's related? I've always seen them referred to as "?" blocks, which I suppose is "question" blocks in audio. Graffiti is a common occurrence everywhere I've been, in both bathrooms and on overpasses and trains - taggers seem to like the trains and the overpasses, but I've seen a few coherent thoughts expressed here and there. 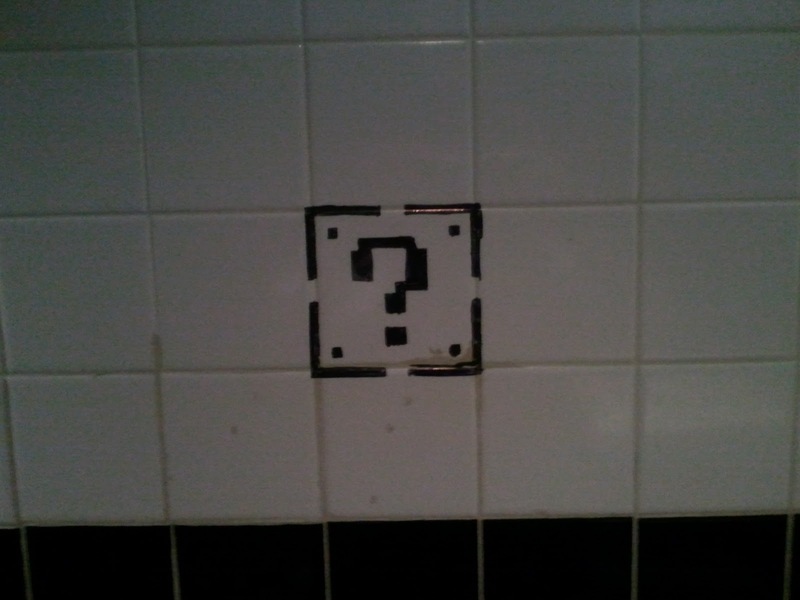 The graffiti in the bathroom, though, is usually gentialia, crude sexual references, and homophobic slurs and taunts. I've been tempted a lot of the time to add "Raise the level of your discourse, gentlemen" and see if someone takes me up on it. Still, as graffiti goes, the ? block is a much better idea, one more in line with an MIT hack (and they've had more than a few doozies, including post-it type note art...) than with what I normally have to see. I've made my first post on .hack//SIGN. It's mostly general stuff that's the result of doing a marathon viewing of the entire series in a day and then trying to write about it well after I should have been asleep. The most entertaining graffiti I've personally seen was an apology to the janitors on behalf of whoever wrote all the dirty limericks and so forth. That's like yelling an apology for being too loud. LOL. I frequently apologize for apologizing too much in Real Life. On the door of a bathroom stall in Waterloo-Westmount Park, somebody has written "Phil Collins Rules" (in quite nice handwriting, too). It seems out of place amongst the hearts with initials in them and anonymous declarations of "I Am Not a Virgin". It was there when I first entered that bathroom, three or four years ago, and (as of October; I don't go to the park in the winter) it's still there. (I always check.) It doesn't look any more faded now than it did back then. It occurs to me it might well have been there since Phil Collins was the latest thing. Two years ago, I visited Casa Loma. The historical stuff was all well and good, but the graffiti at the top of the tower stuck with me. There were hundreds of "I Was Here"-type messages in at least four alphabets covering the walls, some of them older than me. All those people, leaving tiny pieces behind. So many had stood where I was standing.